PARIS. 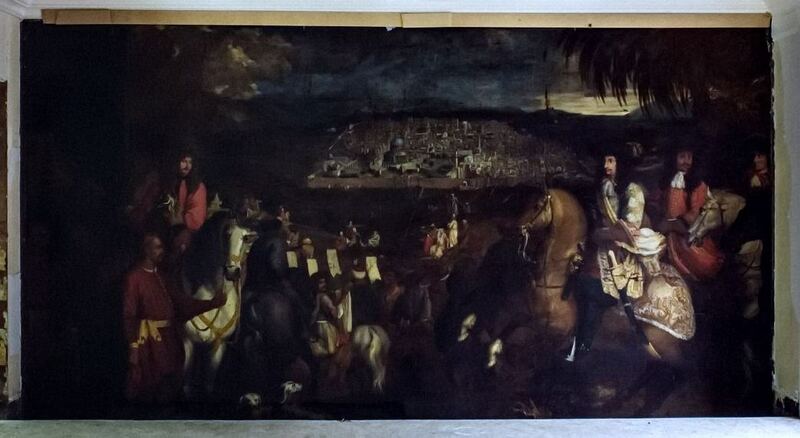 During repairs in the new boutique of the American brand Oscar de la Renta in Paris, found a large canvas, previously dated to the 17th century. Presumably, the canvas was hidden by the owner under the skin during the Second World War. The size of the picture is 3 by 6 meters. The story began in the summer of 2018, when Alex Bohlen, the executive director of Oscar de la Renta, received a call from Natalie Ryan, who was preparing the premises for the opening of the store. “We have found something, you should look at it with your own eyes,” he recalls her words. The last time he received such a call about the store, their plans to move the wall had to be curtailed due to fears that the building would collapse. Clenching his teeth, he boarded a plane from New York to Paris. Miss Ryan took him to the second floor of what was supposed to be a store. Something was hidden behind a wall, and it was not asbestos. It was a huge oil painting, in which the 17th century Marquis and the various courtiers, skillfully combed and dressed, entered the city of Jerusalem. “This is a very rare and exceptional canvas for many reasons,” says Benoit Janson, a restoration specialist who oversees the work on the painting, in an interview with The New York Times. Namely, "its historical and aesthetic quality and size." It is now established that the oil painting on canvas was created in 1674 by Arnaud de Vuez, an artist who worked with Charles LeBren, the first artist of Louis XIV and the interior designer of Versailles Castle. After working with LeBren de Vuez, who was known for participating in fights of honor, he was forced to flee France and ended up in Constantinople. The plot was reproduced by Albert Vandal in the 1900 book “Ambassador Odyssey: Travels of the Marquis de Nointel, 1670–1680”, which described the journeys of Charles-Marie-François Ollet, Marquis de Nointel and d’Angervillé, Ambassador Louis XIV to the Ottoman Court. Page 129 depicts a rotogravure depicting the Marquis de Nointel arriving in Jerusalem with great pomp. Why the canvas was glued to gauze on the wall, is still unknown. There is a suggestion that this may have happened during the Second World War. As a result of the storage conditions, the lacquer in the picture darkened. Also present on it are the results of previous restorations. Oscar de la Renta planned to open its new store in Paris at the end of January 2019, in time for the haute couture show. As a result of the work of restorers, the opening of the store is postponed for several months.